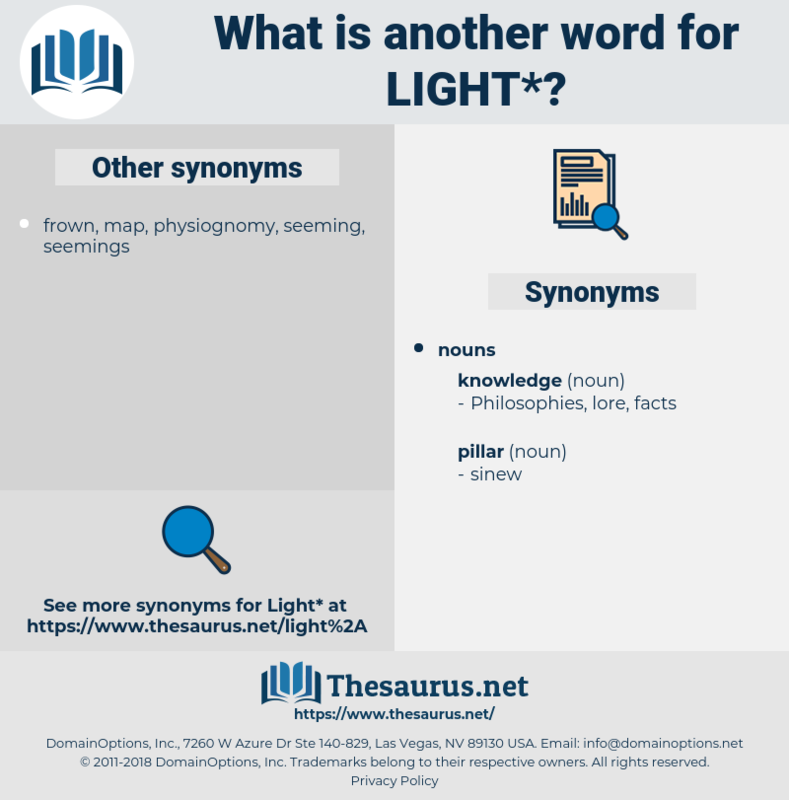 What is another word for light? light-weight, lighted, light-commercial, ultralight, light-duty. 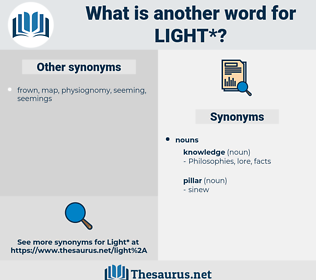 flashlight, lightness, light-duty, illumination, twilight, spotlight. brighter, lightin, glowing, luminous, incandescent, easy, faint, small-sized, modest, soft, gentle, illuminance, photon, marginal, agile, nimble. Children, fireworks, less, FLS, heads, SRS, luminous. highlights, data, cola, limelight, lightning, sight, backdrop, consideration, accordance, insight, conjunction, luminosity, standpoint, glow, glare, glimmer, luminous, birth, prism, viewpoint, clarification, gleam, vista, photon, reason, virtue, spirit, consequence, eyesight, brilliance. highlights, reflects, suggests, identifies, points, examines, indicates, underlines, consists, recognizes, reveals, becomes, shows. down, sad, upset, tiring, boring, unfunny, depressed. dull, dusky, gloomy, solemn, laborious, serious, darkened, difficult, black, dim, unhappy, brunette, weighted, obscure, cloudy, grave. coarse, big, significant, thick, strict, rough, clumsy, large, important, useful, oppressive, fat, strong. firm, concentrated, bold, wild, violent, brave, harsh, loud. slow, extra, chaste, intricate, problematic, painful, subdued, prolific, stressful, considerable, complicated, abstruse, forcible, bursting, copious, largish, satisfactory, caustic, luxuriant, labored, inert, gloominess, abrasive, oversize, irritating, pitch black, compact, fatty, overweight, sizable, whacking, roughened, huge, maladroit, involved, stern, bulky, savage, blooming, inept, powerful, ungentle, stressed, surplus, excess, pitiless, fertile, wooden, enough, ungraceful, swarming, tolerable, rude, proliferative, substantial, lumpish, tyrannical, rugged, klutzy, unwieldy, knotty, stony, sluggish, solid, complex, flourishing, sulky, scathing, disturbing, bungling, great, handsome, Toilful, soggy, adequate, accented, troublesome, super, fruitful, fecund, heavy-duty, extensive, thriving, forceful, indigestible, cumbersome, king-size, herculean, intemperate, recondite, well, voluminous, teeming, goodly, lumbering, inflexible, jumbo, heavy-handed, impure, gruff, heavy-footed, lavish. eventide, sundown, darkness, misunderstanding, misconception, obscurity, dimness, sunset, dullness, night. extinguish, drench, darken, turn off, quench, disenchant, mount, put out. go, move, depart, leave, DO, continue. Now we have found each other, and have come out into the light. lighted, lichgate, low-cost, lost, legato, liquid, lycosidae, lay waste to, leucocyte, lychgate, lock-gate, liquidate, lightheaded, list, lacewood, low-keyed, Lake Tahoe, locked, leukocyte, lactaid, lowset, lac dye, lcd, locket, last, leased, licit, lose weight, liquid diet, Lakota, Lactate, lucidity, leucothoe, legged, legatee, lusty, lockout, loyalist, likuta, locusta, locoweed, lygaeid, low-set, log out, lakeside, last out, licked, listed, locate, lay aside, lucid, lucite, like a shot, lightwood, logic gate, lake chad, lookout, liked, look out, leg it, light-headed, laugh at, lawsuit, lowest, lee side, last day, Lego set, lash out, legate, lose it, locust, look to, lite, lock out, loquat, luck it, laxity, lygaeidae, leak out, low-cut, lesotho, light-duty, loquacity, luck out, logwood, liszt, laced, located, lassitude, locustidae, least, lust, lsd, ligate, liquidity, look at, light diet, luxate. stoplight, traffic signal, traffic light. scintillation, gegenschein, moonlight, shooting star, irradiation, fluorescence, incandescence, daylight, half-light, light beam, streamer, Ignis Fatuus, beam, candle flame, moon, starlight, friar's lantern, twilight, moonshine, torchlight, sun, shaft of light, glow, beam of light, luminescence, sunlight, glowing, jack-o'-lantern, radiance, counterglow, meteor, candlelight, firelight, ray, ray of light, shaft, lamplight, corona, sunshine, will-o'-the-wisp, gaslight. insight, general knowledge, brainstorm, view, public knowledge, brainwave, perspective, position.